It was political revelations that enabled “Der Spiegel” to become the defining medium of the German press scene. Has the news magazine, however, still managed to retain its importance 70 years after it was first published? The German flagship of news journalism, Der Spiegel, is a child of the occupation period after the Second World War, when Germany was controlled by the Allied forces. The first editorial office was run by young men wearing German army uniforms that had been dyed – due to the shortage of fabrics and civilian clothes. They were led by John Chaloner, a British press officer, and journalist, Harry Bohrer, who had returned to Germany from exile. It was their common aim to set up a magazine amidst the ruins of wartorn Germany based on the model of the American Time magazine. Everybody on the staff was absolutely resolute about the rejection of the Nazi dictatorship and the blind faith in the authorities that had prevailed under the regime. As an advocate of a radical social new beginning, Diese Woche, as the publication was initially called in 1946, did not shy away, either, from criticising the Allied forces of occupation. They, in turn, promptly disposed of this opposition in their own ranks by simply putting Diese Woche into German hands. 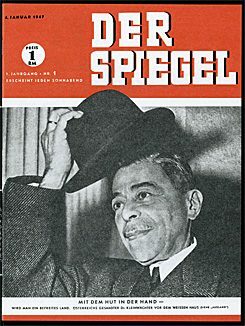 On January 4th, 1947, the first edition of the magazine, renamed Der Spiegel, came out with Rudolf Augstein as its publisher and editor-in-chief. Der Spiegel 1/1947 | Photo (detail): © DER SPIEGEL The story of the founding of Der Spiegel is still the mainstay of the weekly news magazine's political mission. 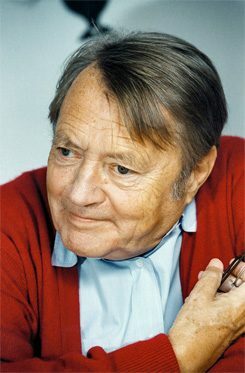 Rudolf Augstein (1923-2002) called it “the assault gun of democracy”, and indeed Der Spiegel has always been understood as the publication that, every week, spells out the spirit of “defensive democracy”, as is anchored in the German constitution. The publishers and editors were, however, concerned primarily with the enemies within the young Federal Republic, i.e. the natural susceptabilty of government to corruption and to making secret deals, as well as the anti-democratic instinct of self-preservation that elected rulers are prone to. The tracking down of revelations in the political milieu was to be the ammunition of the journalistic “assault gun” and quickly became Der Spiegel's hallmark. In 1950, for example, the magazine claimed that the decision to make Bonn Germany's federal capital was partly achieved by bribing people. Federal Chancellor Konrad Adenauer complained about the “Schmierblatt” (scandal rag), which for the image Der Spiegel enjoyed amounted to being raised to the peerage. Publisher Rudolf Augstein | Photo (detail): © Monika Zucht/DER SPIEGEL In the course of its 70-year history, the magazine revealed numerous political scandals, some small – some big. Around 1982, for example, the illegal financing of the political parties by private individuals and business enterprises – and, as the defining medium of the German press landscape, promoted the idea that democracy should not be left alone to its official representatives. This was especially clear in the “Spiegel Affair” of 1962. On the basis of a Spiegel report, the then Defence Minister, Franz Josef Strauss, had had Augstein and several senior editors arrested for alleged treason. In the end, Strauss had to resign and the young Federal Republic served as a beacon for the freedom of the press. The upholding of the ideal of a defensive democracy is the most important legacy of Der Spiegel, which otherwise did not pursue any firm political agenda. Augstein once called the magazine “im Zweifel links” (If in doubt, go for left), but the criticism which the left-wing political camp repeatedly expressed about Der Spiegel showed how disappointed the left was with the magazine's “neutral” attitude towards the 1968 student revolt in Germany. However, this reproach was based on a fundamental misunderstanding – Augstein saw his publication as a guardian of democracy and not as a propagandist for social developments. On the other hand, the criticism of the language and the narrative style of the magazine struck at the very heart of Der Spiegel's self-image – as early as in 1957, Hans Magnus Enzensberger, complained that the stories tailored to the magazine's political readers were only a mere substitute for true clarification and problem-solving. 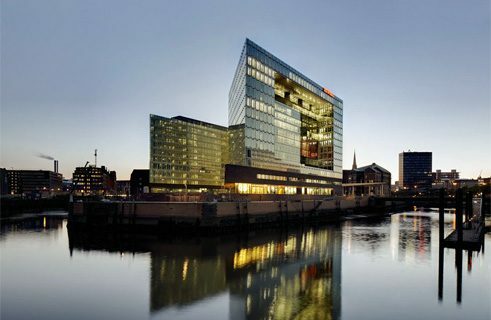 New “Spiegel” headquarters in Hamburg | Photo (detail): © Noshe/DER SPIEGEL In the 1990s, Der Spiegel magazine reached its publishing peak when the magazine regularly sold over a million copies and reliably presented the issues of the week. Since then, the magazine has suffered a decline in importance; by the end of 2016 the number of copies sold fell to under 800,000. in the meantime, publications like the Süddeutsche Zeitung are also successfully focusing on revelatory interest. Moreover, the upheavals in the media world have also had an impact on Der Spiegel. Although it also played a pioneering role in the realm of private television (Spiegel TV) and went online with its Spiegel Online site, the brand and image of the news magazine was not strengthened by these developments, but was more softened into a popular “tabloid” form. More importantly, the principle of a defining journalistic medium seems to be somewhat outdated in these times of a much more differentiated media landscape. Today Der Spiegel is just one important voice among others; at the same time, however, its historical significance still tends to make it the first among equals. Michael Kohler is a freelance critic and author who lives in Cologne.